But it’s worth making a few observations about Castle Ridge for the benefit of anyone contemplating doing it. 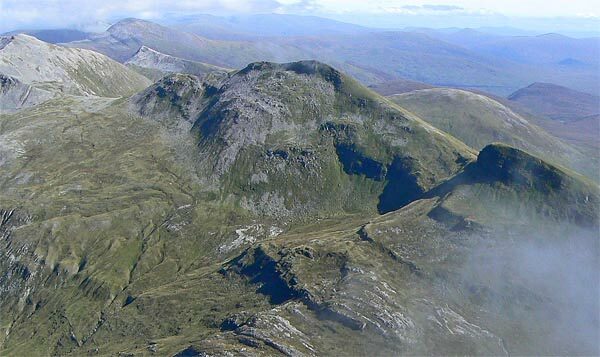 I’d read quite a few WH reports on the Mamores, CMD, the Aonachs, and Grey Corries, and it soon became clear that the North and South ridges either side of Glen Nevis offer some very fine walking. 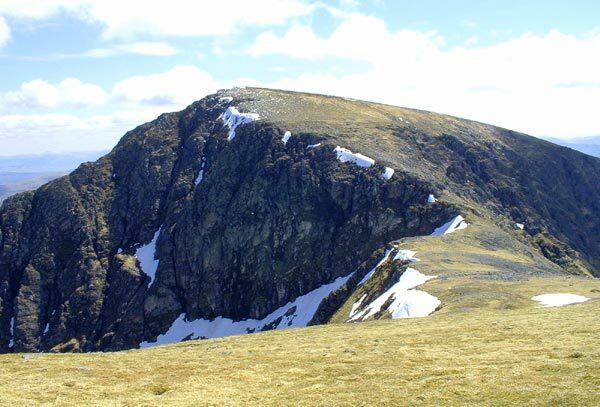 Then, in doing some further research I saw pictures of the North Face of Ben Nevis, and immediately started thinking about possible approaches that would involve a scramble up one of the North Face routes (given that the standard route seems a less than wholly inspiring slog). 1. Both North and South ridges in a single round. 2. North ridge only, ascending the Ben via Tower Ridge. Once I realised that, even I managed to do both ridges in a single round – pretty unlikely - at least 10 hours would be in the dark - ie no views - I ruled that out (that’s my excuse and I’m sticking to it ). And research indicated that Tower Ridge was classified as V. Diff, which implied a pretty long scramble, with, if past experience was anything to go by, a lot of time spent route-finding. So I ended up with Castle Ridge as the preferred route, using a bike for the road part of closing the round. I’d worked out that to drive to the head of the glen, cycle back to the campsite, and be at the bottom of Castle Ridge in reasonable light, I needed to be up at 3.45am; and that’s when the alarm interrupted my sweet dreams! I was soon following the lights up the hillside, and arrived in the glen-through-which –the-Alt-a’-Mhuilinn-runs (why no name???) about an hour later. Looking up the glen, I was absolutely dumbfounded at my first view of the North face of Ben Nevis. Though I’d looked at numerous photos in preparation for the scramble, nothing prepared me for the overwhelming reality of that HUGE face – absolutely stunning: more than double the height of anything in England or Wales. Trying to capture in words that feeling of awe, amazement, exhilaration – and many other emotions besides – is a pretty futile exercise; and pictures don’t do places like this justice either. You just have to see it yourself! 20 minutes later I arrived at the base of Castle Ridge. The Douglas Boulder and Tower Ridge in profile looked pretty intimidating, and certainly time-consuming to ascend, so I was glad I’d opted for Castle Ridge. At a distance the rock looked very attractive, so instead of following the “Scrambles in Lochaber” instructions, I thought I’d take a more direct route. 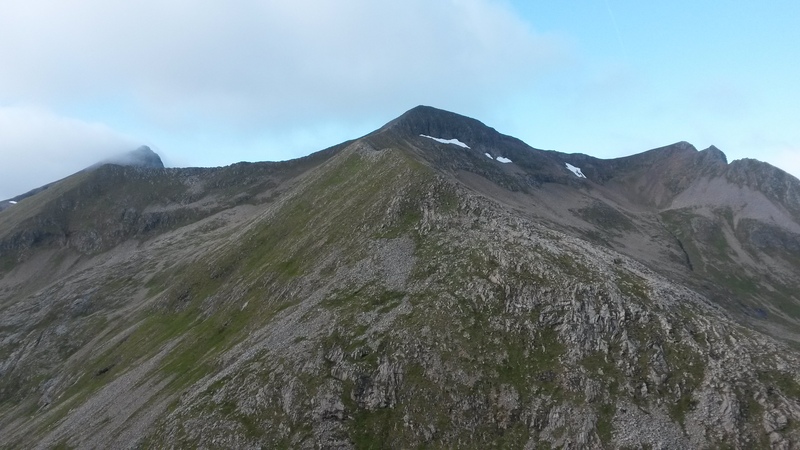 North Face and Castle Ridge (far right hand side, approximate scramble route marked). NOT my picture, sadly. Once on the face I got quite a surprise: wet rock, lots of slippery lichens, angle of strata downward and outward sloping, many frost-loosened “holds”, and generally the rock quality much worse than I’d fondly hoped, with many fewer jug holds than expected. So after about 30m of very slow climbing, I peeled off left to traverse back towards what I took to be the “correct” line, and then followed crampon marks up, as recommended in “SiL”. Unfortunately, crampon marks don’t reveal whether their creator was a scrambler or a full-on climber. Some hundreds of vertical metres of reasonably challenging scrambling later, I arrived at a short crux point. I could only see about 7 or 8 metres up, but it looked doable. On the other hand, ascent of the crux would have involved smallish holds, with significant exposure and concomitant consequences in the event of a slip. And most critically, it would have breached my key scrambling principle: never ascend at the limit of your grade, because you probably won’t be able to descend if you can’t make progress up. An ancient rusty piton confirmed my decision, if it needed any confirmation! So I backed off, traversed a long way left to the gulley, and then wove a way through grass and wet rock to the top of the ridge. From the descriptions of the route, I obviously didn’t get the right one: it took me nearly 2 hours to get from top to bottom. 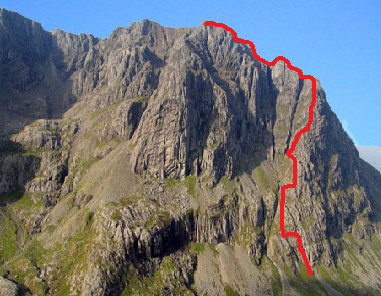 Castle Ridge - approximate scramble route taken. So I wouldn’t recommend it, unless you already know the correct route. 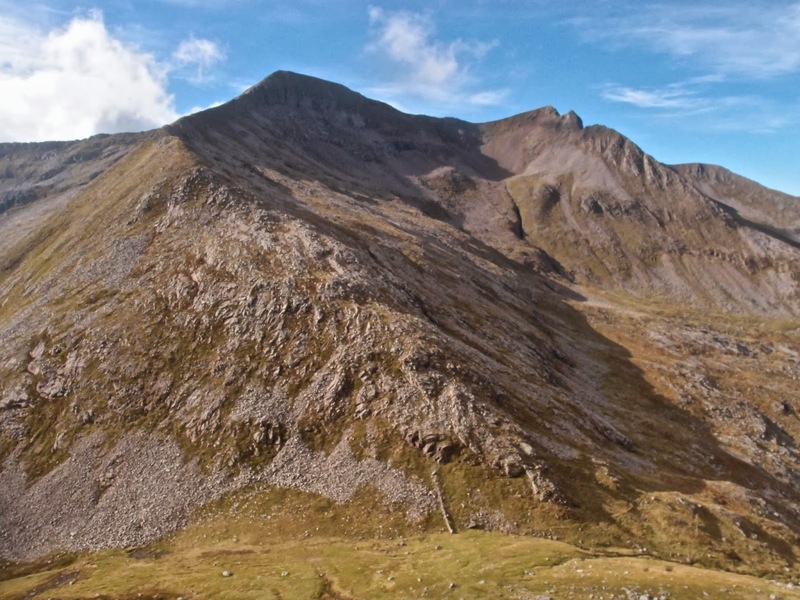 But definitely worth going up the shoulder of the ridge, for the awe-inspiring views as you walk along the ridge from Carn Dearg and along to the Ben. 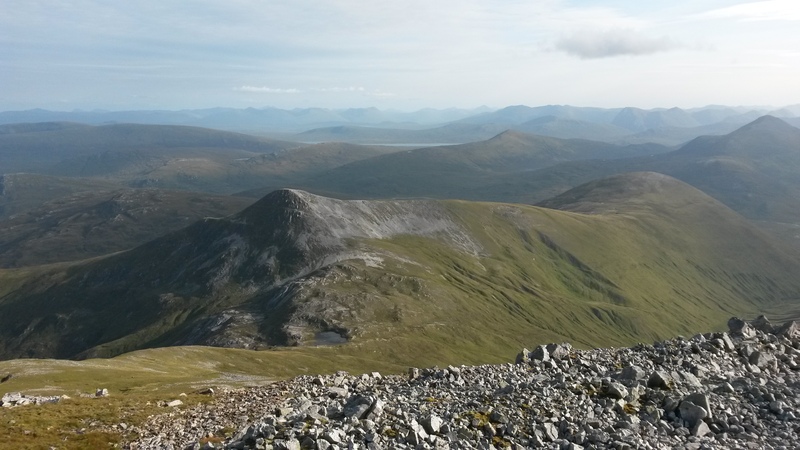 The summit of the Ben was as expected – large numbers of often loud people. For some reason it suddenly occurred to me that it was probably around 50 years to the day that I’d last been on the Ben (a Scout summer camp), and my hazy recall is that it was pretty crowded then! Moreover, the top 50m were clag-bound; so I didn’t hang around, but headed down to the CMD Arete. 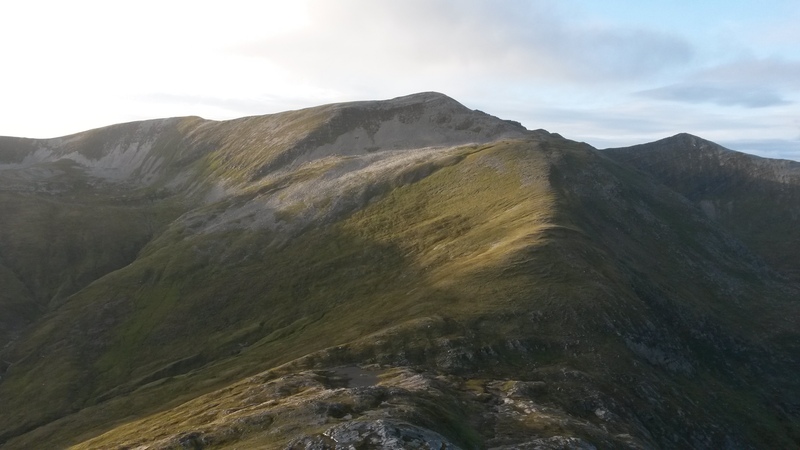 This is a really wonderful ridge that every lover of the Highlands should do, meeting as it does the most important criterion of any top ridge route: brilliant views both sides of the ridge! 20150905_101441. 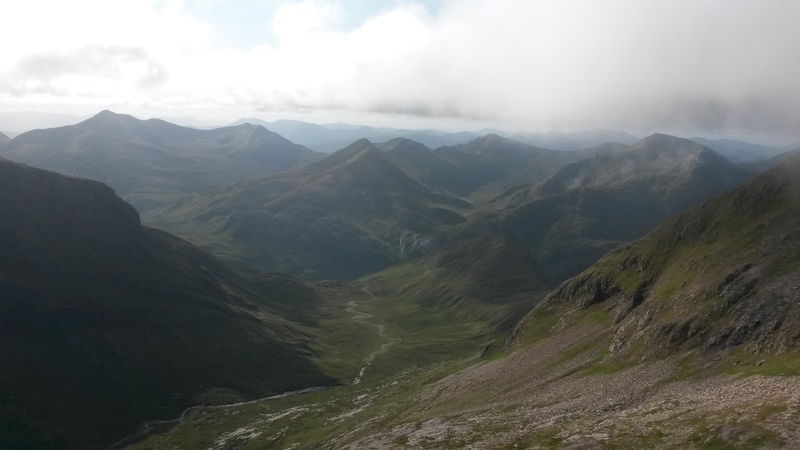 Looking South from the CMD Arete into Glen Nevis. 20150905_104904. The same from further along. 20150905_101755. Looking in the opposite direction down the Glen-with-no-name, with the North Face on the LHS, and Castle Ridge in profile at the end of the glen. The path avoids any difficulties if you’re not so keen on a bit of scrambling, so there’s no reason for practically anyone not to do it! It may well be a different proposition in winter, but in summer I’d say it’s a PoP. As I got to the other end I bumped into a couple of walkers, the older of whom asked whether I thought they should turn back: “we’re not used to this”, he said. I just hope I don’t get prosecuted for telling him he most certainly shouldn’t, and that the path was extremely straightforward! 20150905_102807. Looking back along the million-times-photographed CMD Arete. 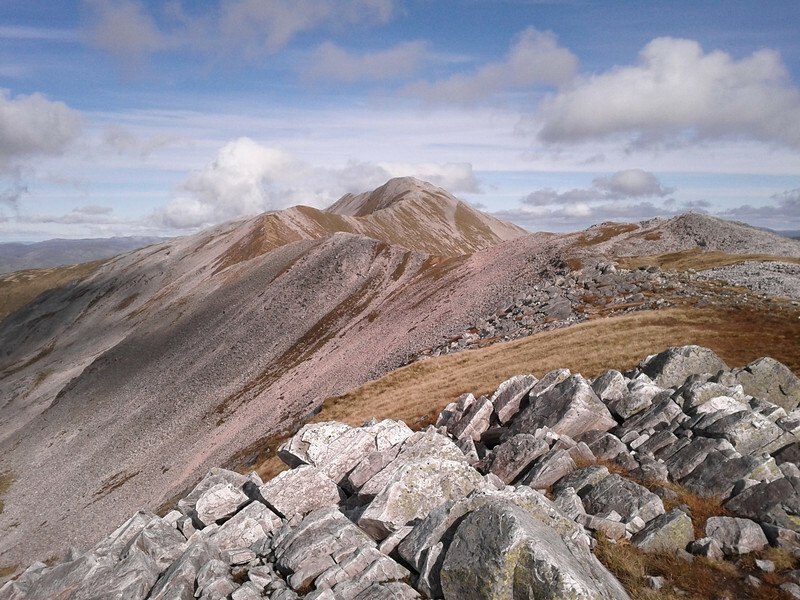 The Mamores beginning to show gracefully in the background. 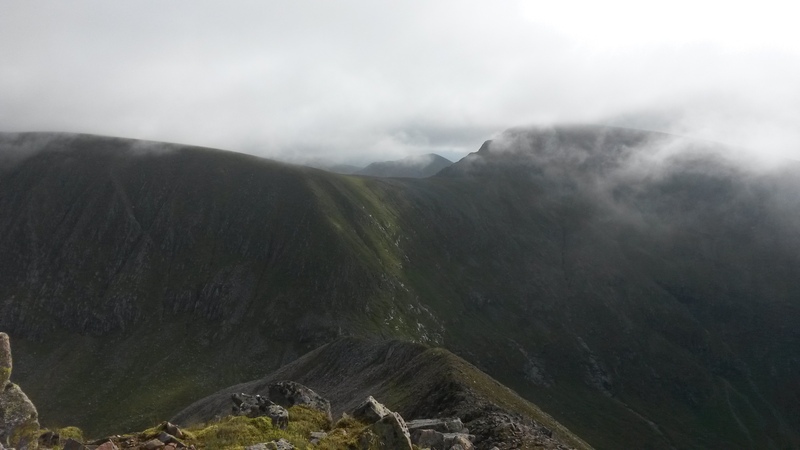 The summit of CMD itself was in clag, so I immediately headed down the watershed ridge towards the Aonachs. 20150905_104455. Down the watershed towards the Aonachs Mor (LHS) and Beag (RHS). The 400m of descent and ascent all too evident!! 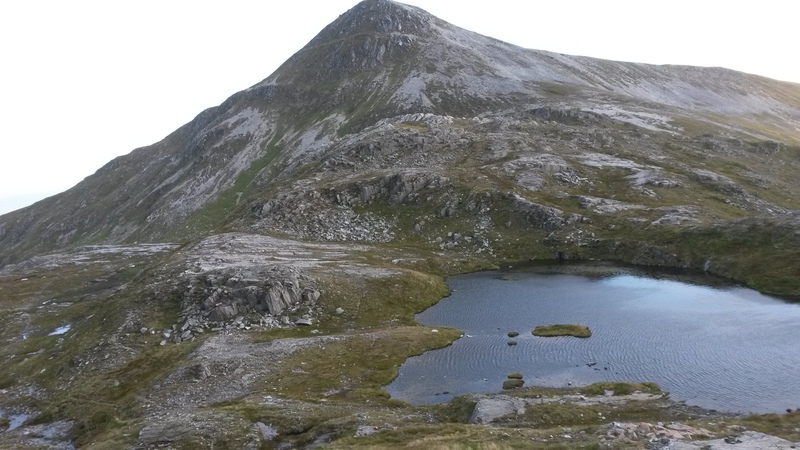 If I'd waited 10 minutes, though, the summit would have cleared, and a quite detour to Carn Dearg Meadhonach would have been very worthwhile. 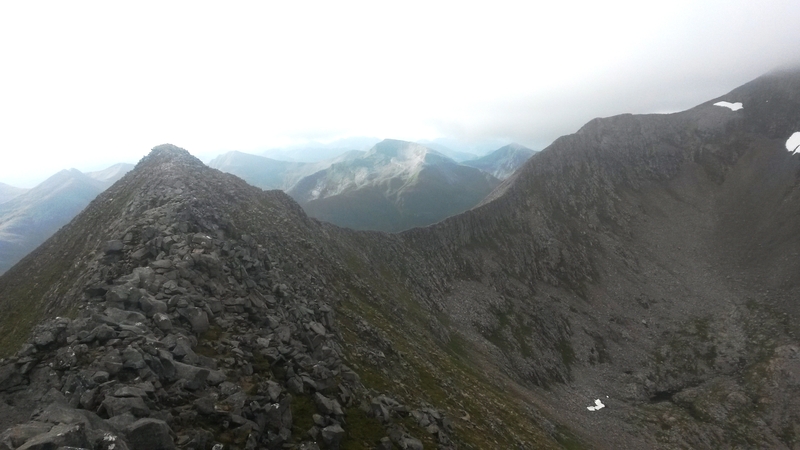 Looking back towards CMD (LHS) and Carn Dearg Meadhonach (RHS) from the ascent to the Aonachs. 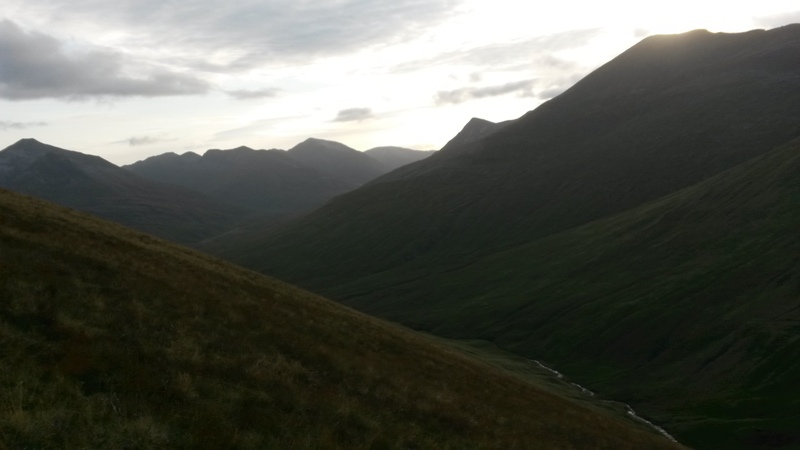 Once the ridge is regained, the slight detour to Aonach Mor is just worthwhile - it's rather flat featureless upland; but going back towards Aonach Beag fires the spirit again. Approaching Aonach Beag from Aonach Mor (not my pic, hence the quantity of snow!). But by now the high level cloud had dissipated, and this is pretty well how it was. 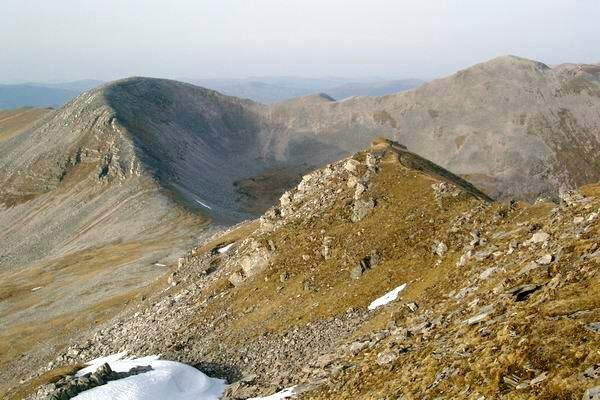 Grey Corries from AB - this is where I'm heading (not my pic). From then on it was all pretty straightforward in walking terms, except for the phenomenal views. I must have taken literally 200+ pics, all sadly now lost . 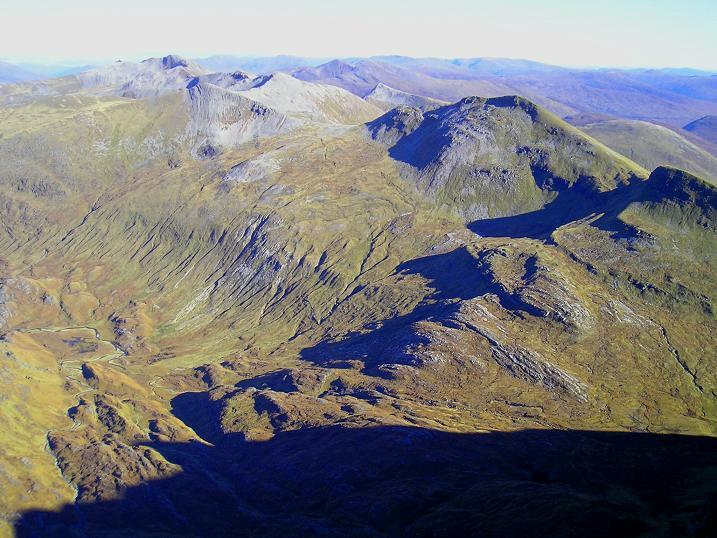 Grey Corries from Sgurr Choinnich Mor (not my pic). Apart from being spectacularly light grey (surprise!) 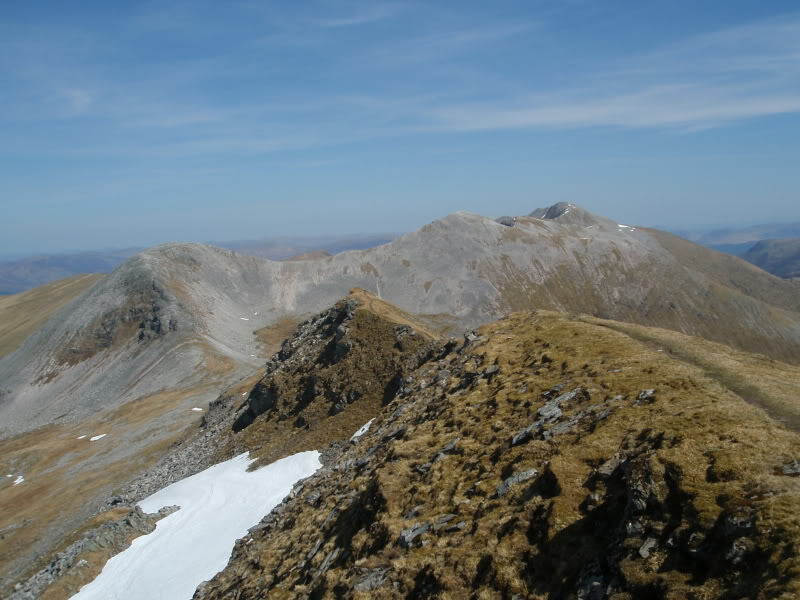 the Grey Corries ridge makes for a wonderful gentle upland walk, and meets at 5 star level the critical ridge walk criterion. 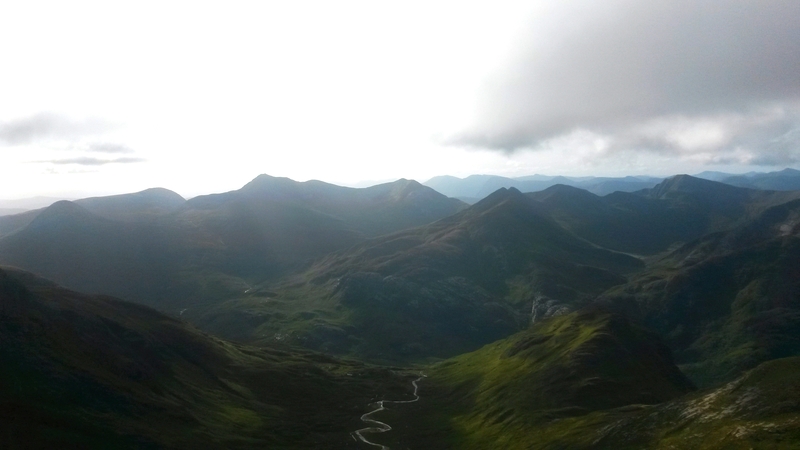 looking NE from the top of Sgurr Choinnich Mor towards the Grey Corries. (not my pic). Arriving at Stob Coire Claurigh, it was really quite breezy, and consequently chilly; so I headed off downhill a little – perhaps 50m or so - towards Stob Ban, before sitting down for a sarny. I was thinking: it is now 16.30, so I should be able to get back in daylight. Not to be. About 5O metres after setting off from my break spot, I realised that I hadn’t got my camera with me. After 90 minutes of systematic quartering of the whole area achieved nothing, I reluctantly concluded that my record of a brilliant day was lost. 20150905_180427. 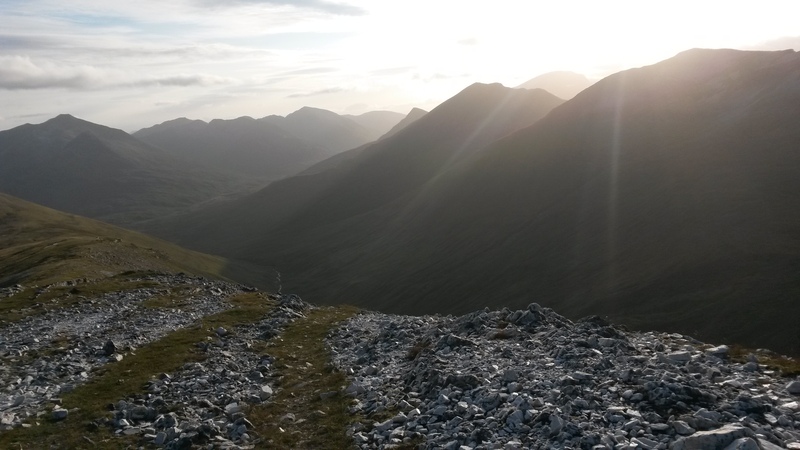 Looking towards the head of Glen Nevis from Stob Coire Claurigh, with Meall a Bhuirich on the LHS. 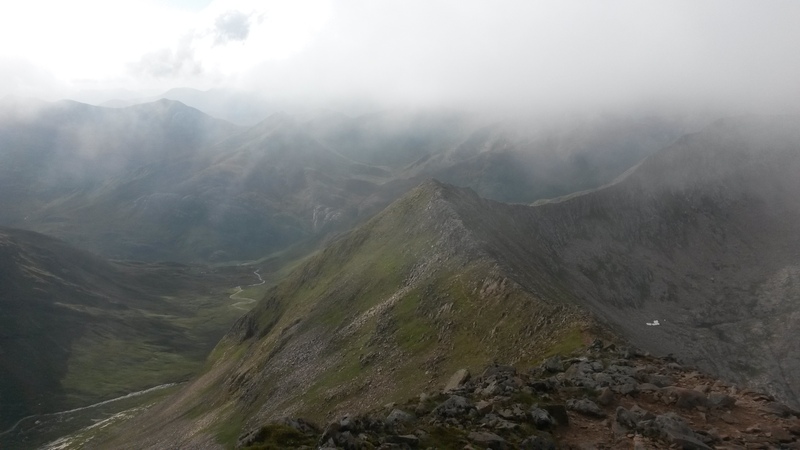 And so, heavy hearted, I headed off to Stob Ban. [ 20150905_181649. Just about to ascend Stob Ban - the last ascent of the day! 20150905_184345. Looking back towards Stob Ban and Stob Coire Claurigh from the low point between Stob Ban and Meall a' Bhuirich, just before the sharp descent into the glen. 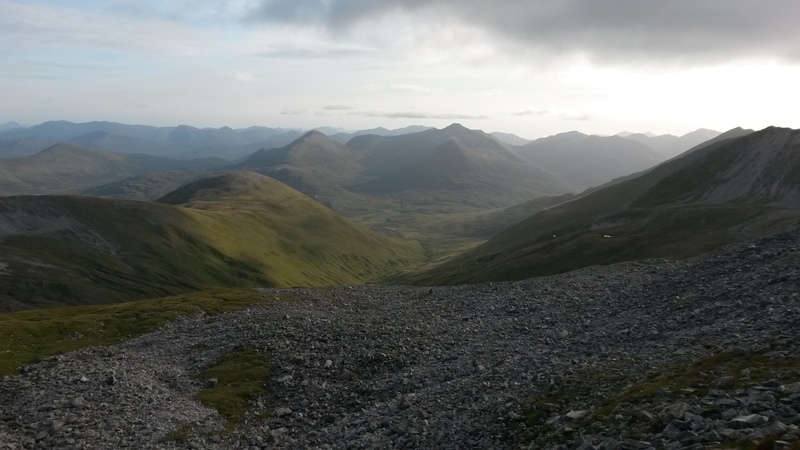 20150905_184357, View looking South West from the same point, towards the head of Glen Nevis, with the Mamores on the LHS and the Grey Corries on the RHS. 20150905_190205. Half way down into the glen, just before it becomes too dark to take pictures. (my CEO LOVES the smell emanating from my footgear after boggy days like this.....). Last edited by Alteknacker on Fri Jan 25, 2019 6:29 am, edited 3 times in total. Real bummer to lose your camera, but looked like a fun day none the less.. I was exhausted just reading about it. Did the Aonachs and GC recently, and that was more than enough for me Wouldnt fancy the glen nevis path in the dark either, its difficult enough in daylight..
Great read, pity about the camera though. I got a GPS returned after making a lost & found post on UKC. Castle Ridge looks interesting and I found a video https://youtu.be/cwHbKExpB5U ...er maybe one for next year...in very dry conditions. A great day out by the looks of it. I've considered adding the Aonachs and possibly Carn More Dearg onto the Grey Corries, but by the time you get to Ben Nevis it is quite a long day! I did Castle Ridge about 10 years ago - had a bit of an off day, and it was damp and cloudy. Didn't enjoy it as much as I wanted to. Fortunately my mate had a rope as I wasn't up to the crux without. In the end it was only a couple of awkward moves. I much preferred Tower Ridge, although it had more awkward bits. Bad luck with the camera - hope it turns up. Another great day in Scotland ! Another incredible effort. What a shame about the camera. I can just imagine the frustration you must have felt during those 90 minutes of searching - soul destroying! It sounded like a pretty scary experience going off-route on Castle Ridge (never done it myself) - but what an addition to an already titanic outing! The return march in the dark, stumbling through the bogs, must have seemed endless. Amazing stuff as usual. gman wrote: Great read, pity about the camera though. I got a GPS returned after making a lost & found post on UKC. Castle Ridge looks interesting and I found a video https://youtu.be/cwHbKExpB5U ...er maybe one for next year...in very dry conditions. Yes, on advice from other WHs, I've posted in a few places, thanks. But I'm not optimistic: I really did search the area thoroughly and systematically (using an unusually shaped rock, moved along at 2 m spacings, to ensure I didn't miss anywhere). Thanks for the vid link. I've watched it. It's difficult to get a feel for how challenging it is from head cam pics. But it doesn't look very "scrambly". On the other hand, had I taken this route, it would have saved a huge amount of time, so I probably shouldn't be sniffy about it. Ref dry rock: if my experience is anything to go by, dry rock is a must for a top notch day, particularly on north facing rock, with is usually covered in Lichen etc. Certainly I wouldn't do Castle Ridge (rocky bits) again in any other conditions. For me, slippery rock mean uncontrollable risk factor up by a factor of at least 10. Aww man that's such a shame about your camera as your route looks like a long distance cracker, at least you got some back up phone pics (I've been switching between the phone and good camera too since buying a decent bridge camera) and hopefully someone will find it and get it back to you. A cracking report regardless and that Castle ridge route you did looks insane, you are a scrambling maniac of the highest order, most impressed!!! basscadet wrote: ...Wouldnt fancy the glen nevis path in the dark either, its difficult enough in daylight.. Yes, the "path" was interesting. The main issue in the pitch black was to find the path at all at some points!! Did you do anything on the North Face? If not, what had you in mind? I'm interested in rock conditions after the slightly off-putting experience off-route on Castle Ridge. malky_c wrote: A great day out by the looks of it. I've considered adding the Aonachs and possibly Carn More Dearg onto the Grey Corries, but by the time you get to Ben Nevis it is quite a long day! Yes, it was an excellent day, and would have been perfect save for the loss of the pics! The reason I opted to do it clockwise was exactly that the Corries are really quite mild in terrain terms, so you get the tougher stuff out of the way while your legs are still pretty fresh; if you are considering this route, therefore, there's a lot to be said for doing it clockwise. I'm very interested in your experience of Tower Ridge. Is the rock lichen-covered like Castle Ridge? Did you do the Douglas Boulder also? Did you need to rope up anywhere? Was route-finding reasonably straightforward? Hope that I am not pre-jumping Malky's reply. Castle Ridge is the one long Ben ridges that I have not been to. As for Tower Ridge on one occasion I reached the DG and the gap by way of the, so called, SW Ridge which gave a reasonable intro....just left of the West Gully. Most other times I have gone to the TR using the East Gully approach. The route finding is not at all difficult and some fine variants can be found. Have soloed the Ridge and have descended it after a route on another part of the mountain....I think that the Ridge was first done by descending? Over the years TR has often attracted my attention in different seasons although the NE Buttress route taken direct and the Observatory Ridge are both good days out. That was an epic day you had pity about the camera putting a bit of a dampener on it. 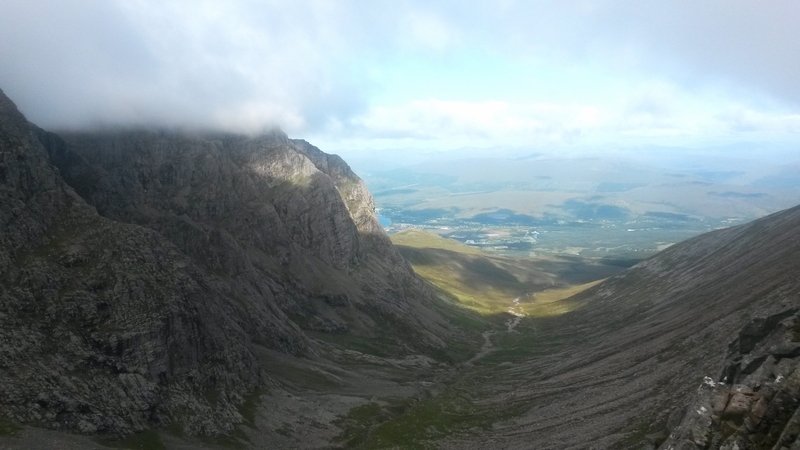 I was up on the Ben last week. Went up and down from the road end car park in Glen Nevis via the SW munro top. I have just been sifting through all the walk reports from the Ben and the route i did isnt covered so might try and post a report. It is nowhere near as complicated or strenuous as your route though my legs still hurt. Aw, what a shame about your camera! These hills are very photogenic, what a pity to not have the pictures. Epic walk though! I’m not a scrambler, but Castle Ridge sounds like it was quite an involved effort.